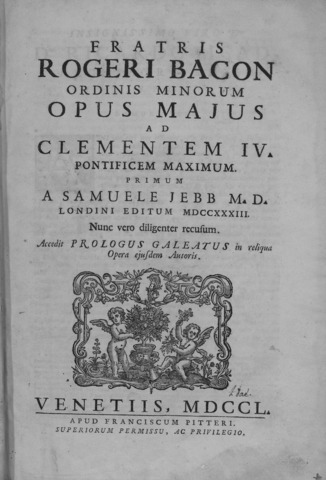 Franciscan friar Roger Bacon was one of Europe's first and most influential scientists, and Opus Majis was his most significant work. Discussing topics ranging from the relationship between philosophy and theology to optics to the first western documentation of the recipe for gunpower, Bacon was a strong believer in an experimental approach to understanding the world. Nonetheless, he remained a committed Catholic, was written with the intention of advancing the church in a manner that made it better prepared to weather innovations and threats from outside it.